Christmas is a time of magic, and now you can color your season even brighter with more than thirty original, festive designs, plus 12 pages of DIY projects including color-your-own gift tags, postcards, wine tags and more! From highly detailed to fun and free-flowing, each design will deck your heart and home with the holiday spirit. Designs include: Christmas trees to make your own; winter wonderlands, polar bears and penguins; charming gingerbread houses, wreaths, and stockings; whimsical scenes of snowmen and ugly Christmas sweaters; a Santa sighting or two, plus heartwarming expressions of holiday cheer written in exquisite typography. Throughout this book you'll find colored art from Kristin van Lieshout and others. Use it to inspire your own creativity or simply cut it out and use it to decorate your own gifts! Christmas has always been my favorite time of the year! Ever since I was a little girl, I have loved every part of it: the sweet smells of cinnamon and pine needles, hot apple cider boiling on the stove, helping my mom unwrap all the ornaments and decorate our tree, drinking hot cocoa and watching lights twinkle while singing Christmas carols—and the list could go on! One of my favorite family traditions was creating art together during Christmas. Whether it was making ornaments with homemade play dough, painting wooden rocking horses, or cutting snowflakes out of paper, it was always a special time with family as we celebrated the joy of the season. It's my hope as you spend time in these pages that you will experience that same joy of Christmas—that you will relax, have fun, and be renewed as you create; and most importantly, that you will be reminded of the true reason we celebrate this special day—our Savior and True Hope coming into the world to save us! Thank you for letting me share my art with you, and may you have a blessed and merry Christmas! ©2016 HCI Books. All rights reserved. 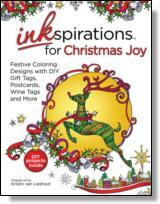 Reprinted from Inkspirations for Christmas Joy: Festive Coloring Designs with DIY Gift Tags, Postcards, Wine Tags and More. No part of this publication may be reproduced, stored in a retrieval system or transmitted in any form or by any means, without the written permission of the publisher. Publisher: Health Communications, Inc., 3201 SW 15th Street, Deerfield Beach, FL 33442.